The final Supermoon of 2014 is about to make an appearance to round off what has been a bumper year for astronomy aficionados. On Tuesday September 9th, the moon will once again to appear bigger and brighter due to it being it's closest point to Earth as it circles around the planet on its' path. Officially known as a perigee moon, a Supermoon is an amazing phenomenon whereby the moon appears to be huge in the night sky. It is at it's largest when situated just above the horizon and people all around the globe experience the Supermoon to varying degrees of brightness as well as size depending on vantage point. The last Supermoon that occurred on August 10th appeared absolutely huge to those living in the North of England and Scotland. During a perigee moon, the moon is a full 30,000 miles nearer the Earth than when it is at its' furthest away point or apogee. The two elements that make a Supermoon is when a full moon coincides with the moon approaching its' perigee. A Supermoon then reflects approximately a quarter more light than a normal full moon which adds to the overall spectacle. Speaking to NASA Science News, Geoff Chester of the U.S. Naval Observatory explained that Supermoons are regular occurances saying "Generally speaking, full moons occur near perigee every 13 months and 18 days, so it's not all that unusual. In fact, just last year there were three perigee moons in a row but only one was widely reported." 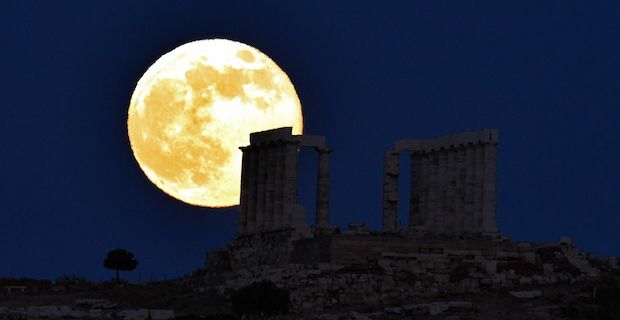 Fans of Supermoons take note that the biggest and brightest one scheduled for 2015 will take place on September 28th. It is one of 6 forecasted Supermoons in the New Year with the others due to appear on January 20th, February 18th, March 20th, August 29th and October 27th.